Roll each omelette into a cigar shape. If hot to the touch, use a paper towel to help with rolling. If desired, slice the omelettes into sections. 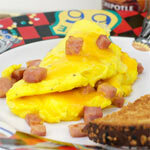 Test Kitchen Notes: This recipe makes about 1 and 1/4 cup of egg mixture, so use a little over 1/2 cup per each omelet. For best results, use a 9-inch omelette pan. After the egg mixture is added to the pan, lift the edges with a spatula to allow uncooked egg to flow beneath the omelette. The German Omelette is a cross between an omelette and a crepe. 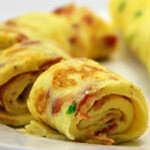 Thanks to a bit of flour and a bit more liquid than usual, this omelette can be easily rolled once cooked. 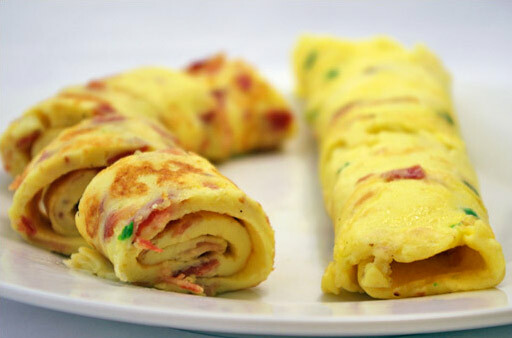 A serving may consist of two rolled omelettes side-by-side or a platter of small appetizer-sized wedges cut to reveal the spiral pattern of the rolled omelettes. For a finishing touch, try topping the omelettes with a little browned butter or gravy. 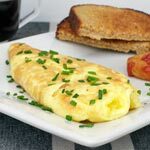 This recipe is a slightly modified version of the German Omelette With Bacon recipe found in The Omelette Book by Narcissa G. Chamberlain. 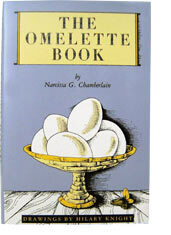 First printed in 1955, The Omelette Book was considered one of the best books on omelettes up to that date. Juilia Child made reference to the book during her own television show dedicated to omelettes. The Omelette Book seems a bit dated now. It's a strange study of how America found chicken livers and brains to be the height of fine dining in the 1950's (Seriously... "Omelette With Fried Brains" is on page 73). However, it's also a great study of how varied and limitless omelettes can be, especially in the caring hands of the omelette obsessed Chamberlain. Check it out if you can find it. 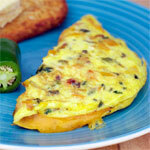 This classic omelette can also be enjoyed at room temperature - European style. Try it instead of a sandwich for an on-to-go lunch or at your next picnic. What do you think of German Omelette With Bacon? Tasty. A little hard to roll. Not as pretty as yours. But good. 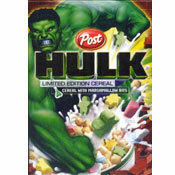 THIS ROCKED. I skipped the nutmeg, but did everything else. It was the best. I tried to do it and it actually came out like in the picture. I really loved how easy it was. I can't wait to do it over and over again. I was shocked how firm but so soft the texture was! It rolled too just like the picture! I will make again definitely. I sprinkled cheddar cheese over it before I I rolled it and then I gave it 10 seconds in the microwave so the the cheese melted all the way. 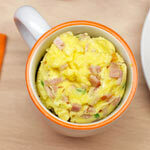 This is the hot, new way to make an omelet (even though I know it's old)! Winner! I think that this was a great recipe. I love trying different foods from different countries. It was very tasty. A little hard to roll into shape (one of them ripped a little), but it was fun to eat an omelet in a different way. BTW... my husband suggested cutting them into sections and serving them with toothpicks as an appetizer. Pretty good idea, right?